Can Heart Rate Variability be used to Estimate Gas Exchange Threshold in Obese Adolescents? 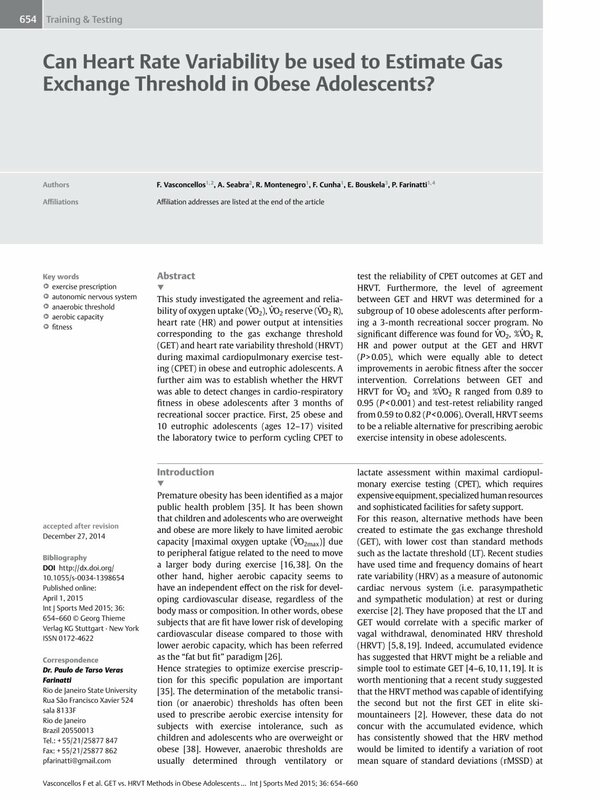 This study investigated the agreement and reliability of oxygen uptake (V̇O2), V̇O2 reserve (V̇O2 R), heart rate (HR) and power output at intensities corresponding to the gas exchange threshold (GET) and heart rate variability threshold (HRVT) during maximal cardiopulmonary exercise testing (CPET) in obese and eutrophic adolescents. A further aim was to establish whether the HRVT was able to detect changes in cardio-respiratory fitness in obese adolescents after 3 months of recreational soccer practice. First, 25 obese and 10 eutrophic adolescents (ages 12–17) visited the laboratory twice to perform cycling CPET to test the reliability of CPET outcomes at GET and HRVT. Furthermore, the level of agreement between GET and HRVT was determined for a subgroup of 10 obese adolescents after performing a 3-month recreational soccer program. No significant difference was found for V̇O2, %V̇O2 R, HR and power output at the GET and HRVT (P>0.05), which were equally able to detect improvements in aerobic fitness after the soccer intervention. Correlations between GET and HRVT for V̇O2 and %V̇O2 R ranged from 0.89 to 0.95 (P<0.001) and test-retest reliability ranged from 0.59 to 0.82 (P<0.006). Overall, HRVT seems to be a reliable alternative for prescribing aerobic exercise intensity in obese adolescents.